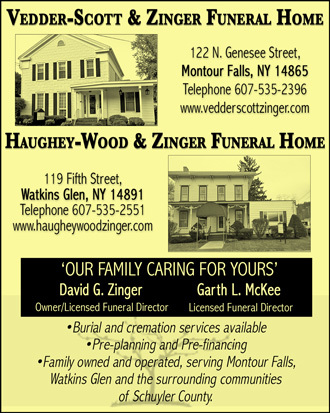 SCHUYLER COUNTY–The Schuyler County Legislature released the tentative 2012 county budget on Oct. 26. The tentative budget allows for total appropriations of $42,397,967. The county is anticipated to generate $29,278,420 in revenue, leaving $13,119,547 to be made up with real estate levy revenue, interfund transfers and an appropriated cash surplus. The real estate tax levy for the county for 2012 will be $10,080,143 which is up from a levy of $9,860,513 in 2011, an increase of 2.22 percent. While overall spending for the county in is being cut by $853,636 in 2012, a decrease in revenue and availability of surplus funds necessitates the levy increase. The spending cuts are even more pronounced when the county’s contractual and state mandated costs are taken into account. The local share of the Medicaid program will increase by $92,451 to $3,751,976. Meanwhile state retirement costs will increase for the third straight year, this time by 22.5 percent. In 2009, state retirement cost the county $739,425.04, and this amount has risen by around $300,000 each year to the 2012 level of $1,727,403. The expense of employment is clear throughout the budget as the cost of paying disability insurance and workers’ compensation insurance will increase substantially in 2012. These increases are offset somewhat with a sizable decrease in spending for medical insurance for county employees. The budgets for the Sheriff’s Department and the County Jail will each increase in 2012. The personnel services cost will increase for annual raises for employees and the funding for “special events” will nearly double to $400,000. The Sheriff’s Department will absorb a slight decrease in spending for training and overtime, and the dog control unit will receive less funding. The 2012 tentative budget seeks to control spending by reducing appropriations for “professional fees & services”, “training” and “contractual expenses” in a number of departments. Notably, the Public Health Department will have their personnel services budget cut by $69,729. It is not clear in the budget whether this decrease will be achieved through attrition, layoffs or pay cuts for employees. The County Attorney’s Office will be losing their contractual overload attorney whose funding has been cut entirely. Service agencies operating within the county will receive less funding in 2012 which will have an impact on their 2012 budgets. The Community Services Board, Finger Lakes Addictions Counseling and Referral Agency, Challenge Industries, Schuyler ARC Inc., Families First, and the Council on Alcoholism will each see a decrease in their funding from the county under the 2012 tentative budget. A public hearing on the 2012 tentative budget will be held on Monday, Nov. 14 at 6:30 p.m. at the Human Services Complex in Montour Falls.